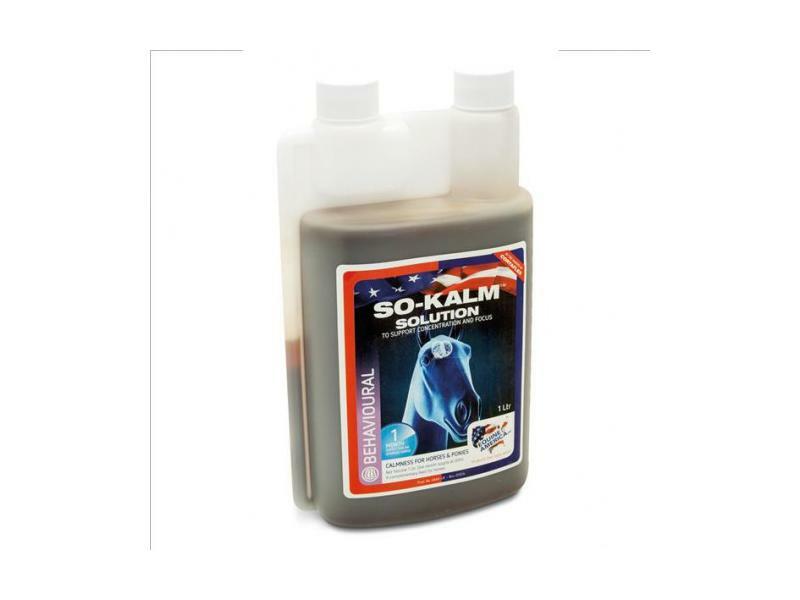 Equine America So Kalm is an effective supplement for horses that are susceptible to stress when eventing or at home in the paddock. 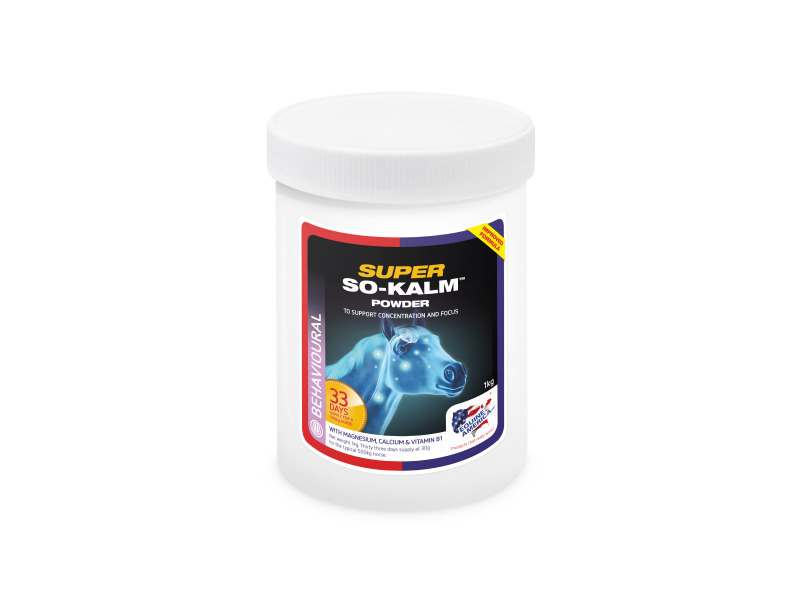 The serotonin promoting formulation helps to settle uptight or anxious horses and focus their performance concentration. Suitable as a supplement to your horse's daily feed. Please note: So Kalm pastes are sold singly in syringes. 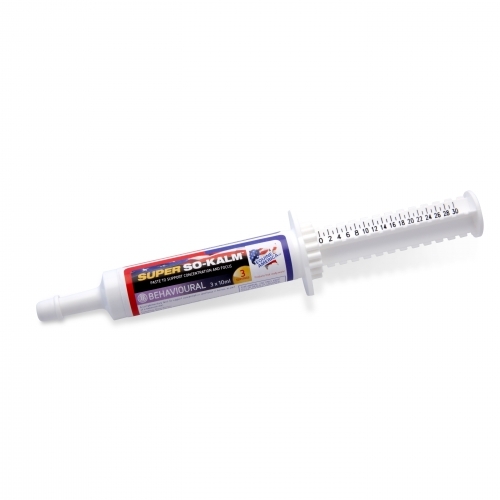 Each syringe contains 30ml of paste which is 3 x 10ml quantities. Dehydrated Alfalfa Meal, Dextrose, Vegetable (Soya Bean) Oil, L-Tryptophan, Magnesium Oxide, Calcium Carbonate. Water, Dextrose, Calcium Carbonate, Magnesium Oxide, L-Tryptophan. Water, Bromelain Extract - 10,000mg/kg, D-Glucose, Calcium Lactate, Magnesium Sulphate. Preservative - Ammonium Propionate - E280 - 1000mg/kg. Vitamins & pro-vitamins - Thiamine Hydrochloride - 7000mg/kg. Preservatives - Ammonium Propionate -E 280 - 1000mg/kg. Thickener - Xanthan Gum - E415 - 23,000mg/kg. Vitamins & pro-vitamins - Thiamine Hydrochloride - 3500mg/kg. Thickener - Xanthan Gum - E415-23000mg/kg. For a 500kg horse, 28g per day. Day of event: feed an additional 28g in the morning of, or 1.5 - 2 hours prior to event. Maximum per day 56g (2 scoops). 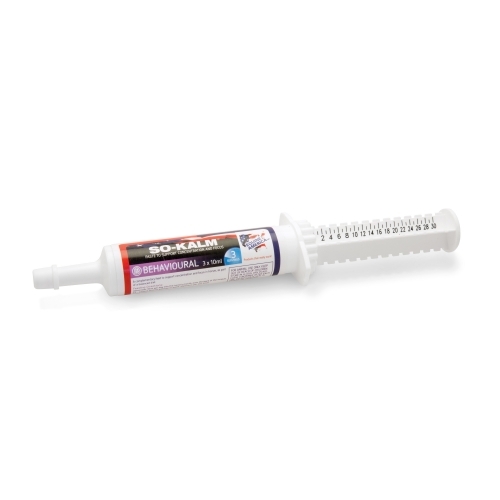 Administer 10ml of contents 2 hours prior to exercise or event into horse's mouth on back of tongue. Administer 10ml of contents 1.5 - 2 hours prior to exercise or event into horse's mouth on back of tongue. Maximum 30ml per day. Below are some recent questions we've received regarding Equine America So Kalm for Horses, including answers from our team. I have a lead rein pony about to go to his first show under saddle. He gets a bit excited at "parties", so I want to give him something to help him and his little rider out, but as he is so tiny, only 10.2hh, I am worried about overdosing him. How much should he have? You could use this product for your pony. I would suggest giving about one third of the amount for a 500kg horse. 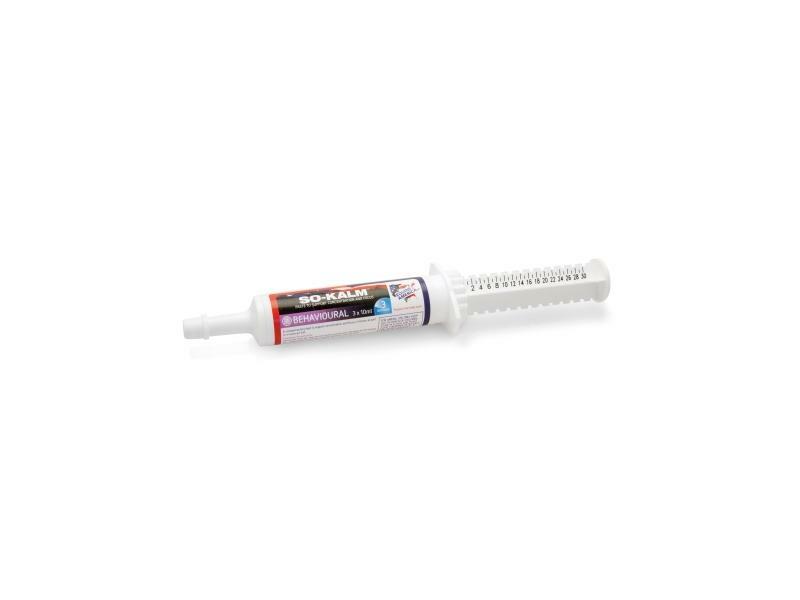 One of the 10ml syringes is one dose for your horse. The effect will last for up to a day. Ideally give a dose every day for a few days, then give an extra dose just an hour or 2 before a competition event. 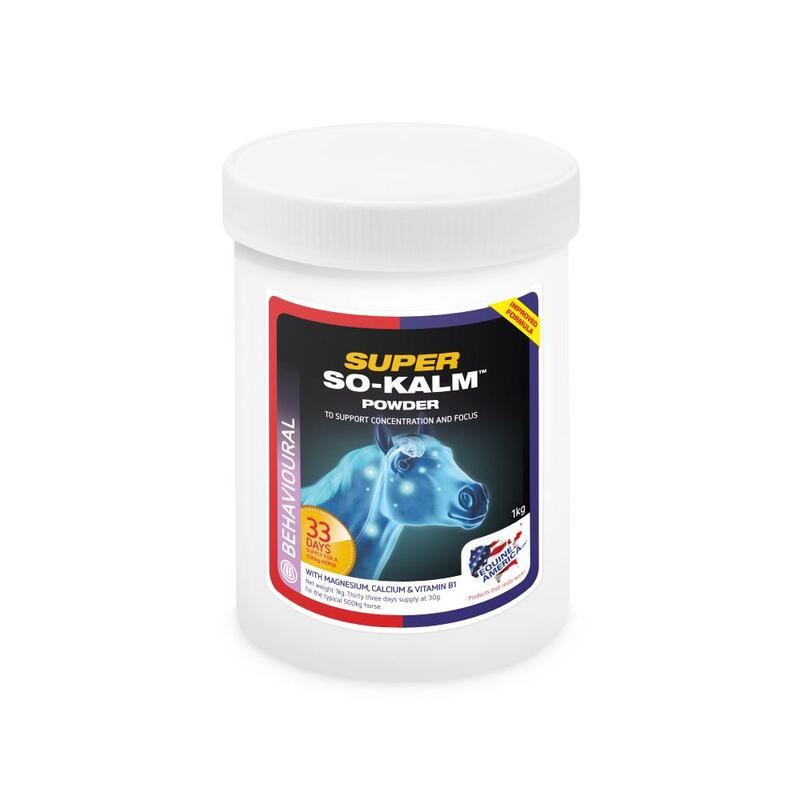 There are lots of different calming products for horses like this and they often do seem to work, though some horses can respond better to one than another. Some trial and error is needed to get the right product. I would rather use a product like this than a hormone treatment.